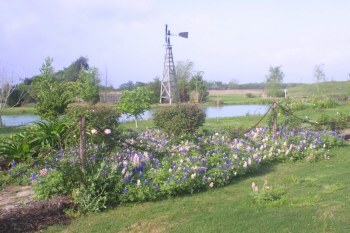 For photos of our gardens, click here. Because they can take whatever is thrown their way. 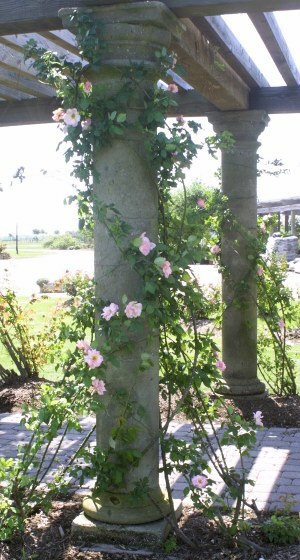 Antique roses have been found in old cemeteries and abandoned homesteads dating from the 1800s. Settlers from Europe brought many of their best roses with them to remind them of home. The amazing thing is that these roses are still alive and blooming. They have withstood droughts, floods, hurricanes, heat waves, freezes, insect infestations and (more recently) lawnmowers. Having been abandoned for the most part, they have not been fertilized or sprayed or watered or pampered. Once their root system is established, many roses can live to be hundreds of years old. The roses are hardy and easy to grow. By definition, old garden roses were found or propagated prior to 1867, the year the first hybrid tea rose was propagated. The roses available through florists are not antique varieties. They sell hybrids that provide long, straight stems with a single beautiful bloom on top. While the hybridized rose bush is not long lived, the flower typically lasts longer after being cut. For the most part, antique roses don't have these characteristics. On the down side, the hybrids have lost most of the qualities we look for when landscaping our homes. Besides being hardy and long lived as a plant, antique roses are known for their fragrance. When you hear someone tell you to "take the time to stop and smell the roses", they almost certainly are talking about very old ones. They are great to pick and share with friends and family, and the more you pick the blooms, the more they bloom. The majority of people today have never had the opportunity to hold and smell a really old rose. So share them with everyone! In the south, most antique roses are evergreen. They are perfect plants for landscapes. Whether along a fence, climbing up a trellis or as a focal point in that special place, they look great even without blooms. There are a few special varieties that only bloom once a year, but most repeat their blooms or never stop blooming. Where should you buy old roses? It is always to your advantage to buy direct from a local, professional grower. Most nurseries buy and sell plants of many types. Buying directly from the source, you will find a wider variety of plants available, specialized expertise and healthy plants. Instead of six or eight varieties to choose from, growers will have more than 100. Not all roses are alike. Some love to be planted in wet areas. Others can withstand a lot of shade. A few varieties are "thornless", which are perfect grown next to the front door. Some will only grow to a height of 12 inches, while others can exceed 12 feet. They each have different scents, different colors and different needs. While not high in number, there are growers of antique roses scattered throughout the U.S. Visiting a grower might require a day trip. But it will be worth the time and effort as the plants will last for decades. Another alternative is buying your plants directly from the grower over the Internet and having them shipped. That will work, too! Do your homework and identify the roses that thrive in your zone. If your grower is physically located in your zone, you can buy anything they grow! Local nurseries might also be an option. But you must be careful when shopping locally. National chains have a centralized, national buying office. Unfortunately, the local stores will end up with plants and trees that will not thrive (or even survive) in their zone. There are exceptions, but their clerks typically won't know any better. Thus, it is imperative you know what you are buying before you take it home when dealing with Home Depot, Lowes or similar chains. Locally owned nurseries are your better choice. Particularly if the owner is on the premises. Locally owned nurseries know what grows well in their (thus your) area. Many employ Master Gardeners as their help. Last, but not least, there are garden clubs that have plant sales. Many County Extension Agents have Master Gardeners that hold annual plant sales, typically in the Spring. Some even grow their own plants locally. Wherever you buy your roses, do your homework. Old Garden Roses have a heritage. Look them up and see how they do in your area. 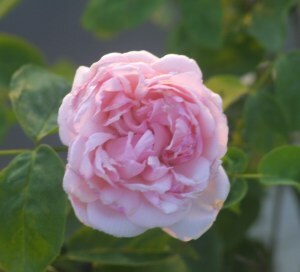 We have photographs and growing habits for some 200 old roses on this web site. Every rose was pictured was grown in our garden in Needville, Texas (zone 8b). This is a hot and humid climate. Sometimes, there is no winter to force the roses into dormancy. It is the most challenging climate in the U.S. If they can grow well here, they can grow further north. If you live in a zone that includes a cold winter or a couple of seasons with 50 degree nights, you will have many more choices. Good luck and be careful. Old garden roses are very addictive!